Found a bug or have a feature suggestion? Use the issue tracker on GitHub. If you report a bug in the comments, I will not fix it. I need the proper information to fix issues, and the issue tracker makes sure it is provided. Comments are fine for questions and small suggestions. Please don't make me disable comments. Note on the config file: I know it's a bit messy right now. Sorry about that, a lot has changed since the mod was first released. I will be restructuring it in 1.13. If you have any questions, leave a comment or PM me (but check the Help! section first). Minecraft too easy for you? After playing the game for years, I can't help but feel it is. Or perhaps it's too hard with all the crazy mods you've added? 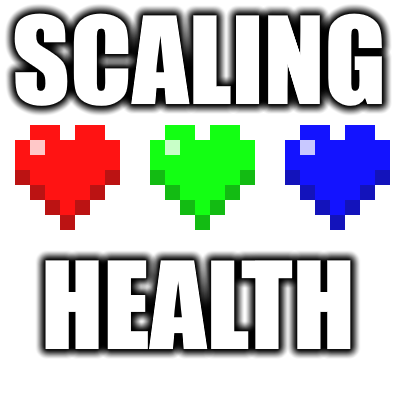 Scaling Health aims to balance out modpacks, by allowing players, mobs, or both to gain extra health! Or players can start with less health, if that's what you want. The mod is highly configurable. This mod started as an unofficial port of Difficult Life, a mod I personally loved playing with. Eventually, I decided to rebuild the mod from the ground up, fixing bugs, adding more config options and widening the scope of the mod to include players who need an easier experience, not just a harder one. The difficulty system is very server-friendly, unlike the system used in Difficult Life. Feedback and constructive criticism are always appreciated. A per-player difficulty system. A difficulty value is tracked for each player. There are several factors that can increase/decrease your difficulty. By default, it increasing slowly as time passes. As difficulty increases, mobs become stronger. Mob strength is calculated based on one of several methods (see below). This feature can be tweaked/disabled to your heart's content. More player health! Or less. Players can obtain heart containers that increase their maximum health. Normally, you keep the extra health even after dying (configurable). The player's starting health can also be changed, and the max health cap is configurable as well. You can also set health to increase/decrease with XP levels. Lots of control. Plenty of config options to let you play the game however you like! There's even an in-game config screen, so you can tweak options without restarting Minecraft. Silent Lib and Java 8 or higher. Easy Mode - Name says it all, this makes the game much easier. The difficulty system is entirely disabled (no extra mob health, no blights, etc) and heart container drops are much more common. Max health cap is raised to 4096. Gentle Mode - Slowly increasing difficulty with a low cap. Blights are disabled. Players gain more health as they accumulate XP (but spending the XP will decrease health). Health from heart containers is capped to 100 (does not count the health from XP), but that can be easily changed if it doesn't suit you. A difficulty value is tracked for each player. By default, this increases slowly over time. You can also set the mod to increase/decrease difficulty when players kill certain types of mobs, or when the player dies. You can also set difficulty to reset at certain intervals, like every week. Player difficulty is typically used to calculate difficulty when spawning mobs, but some modes use other methods (see next section). The starting and maximum difficulty levels and the amount added each second are configurable. By default, idle players accumulate difficulty more slowly. When mobs are spawned, an "area difficulty" value is calculated for the position the mob is spawned at. This value is then used to determine extra health/damage, chance of becoming a blight, etc. Depending on the mode, this is usually based on the difficulty level of all nearby players. "Nearby" means within the search radius, which is configurable. Weighted Average - A weighted average of the difficulty of all nearby players, with distance being used to calculate the weight. In layman's terms, closer players have a greater impact on the area difficulty. This is the default mode. Average - Simply takes the average difficulty of all nearby players. Min Level - Takes the lowest difficulty level of nearby players. Max Level - Takes the highest difficulty level of nearby players. Distance from Spawn - Uses the distance from the world spawn to calculate the area difficulty. Basically, it's distance multiplied by the "Distance Per Block" config option. Distance from Origin - Same as "Distance from Spawn", but uses the distance from the origin (0, 0, 0). Distance and Time - A mix of Weighted Average and Distance from Spawn. Difficulty increases over time, but mobs also get stronger the further from spawn they are! Originally a user suggestion, now my personal favorite! Server-Wide - Or you can ditch my system and use an equivalent to Difficult Life's. Difficulty is tracked at the world/server level. Player difficulty values are completely ignored (but still tracked). Mobs (both passive and hostile by default) will gain extra health as difficulty increases. The way extra health is added can be changed in the config file. Additive mode (ADD) - A flat increase for all mobs. This is what Difficult Life used. New in 1.3.15, you can now increase the amount of damage players take from various sources. By default, no damage scaling is performed. You can customize this in the config under player/damage. You can choose one of three modes: scale with player max health, player difficulty, or area difficulty. Max health mode is proportional to the starting health you set in the config. So if you have 100 health and starting health is 20, that's a 4x multiplier (100 - 20)/20. The difficulty modes multiply the difficulty value by a "weight" value you can tweak in the config. The weight defaults to 0.04, which would result in a 10x multiplier at 250 difficulty (0.04*250=10). I'll call this number the mode amount. For the scale value for each damage source, a value of 0 (default) results in no scaling. A value of 1 would scale proportional to the mode amount, so survivability would not increase with health. Between 0 and 1 might be ideal, but you could also set it higher than 1 if you want to buff certain damage types. The final calculation multiples the scale by the mode amount by the original damage amount, then adds that to the damage dealt. So, something like damage = original * (1 + scale * modeAmount). Blights are extremely powerful mobs. 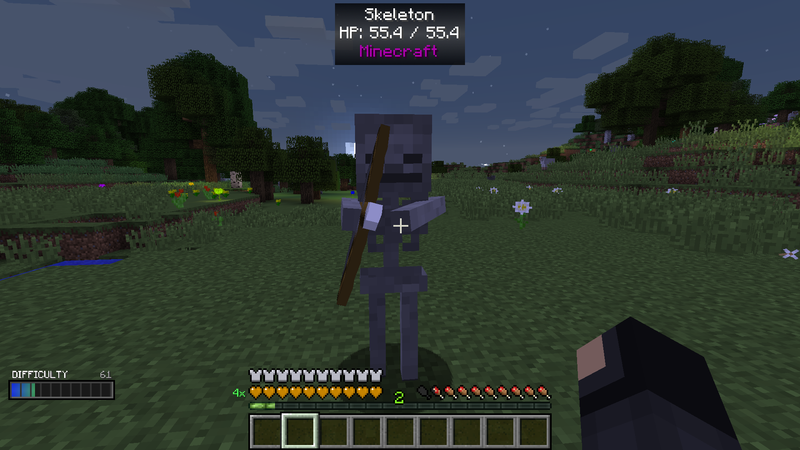 These are ordinary mobs (even from other mods) that have spawned with far more health, higher damage-dealing potential, and a variety of potion effects including a large speed boost. They also tend to spawn with armor. The mobs themselves spawn with an invisibility effect, but are on fire. Blights have a purple fire effect at all times which makes them easy to identify, even if submerged in water. By default, blights drop more heart containers than standard mobs (0-2 each by default, instead of a small chance of getting one) and ten times the XP. Blights have a variety of config options available, and can even be disabled entirely if that's what you want. Heart containers are used to increase players' maximum health. 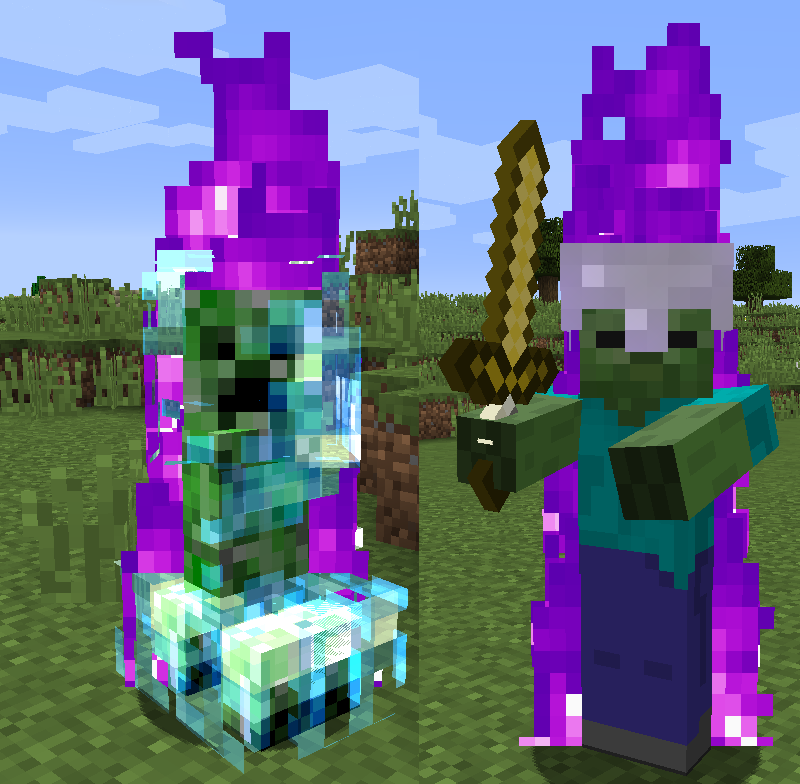 They can drop when mobs are killed (with configurable rates for different mob types) or crafted from heart crystal shards. Simply use (right-click) them to gain one extra heart per container. Heart containers also restore a couple extra hearts. Gaining health from heart containers can be disabled in the config, allowing them to act only as a healing item. Heart containers will make a "ding" sound when giving extra health or a "burp" sound when they can only heal. Bandages and medkits will restore a percentage of your maximum health when used. To apply one, use it (hold right-click) for 5 seconds. You will be given the "Bandaged" potion effect and a portion of your health will be restored each second, but you will move more slowly while this is in effect. The effect is removed if your health is fully restored. Both bandages and medkits require heart dust to craft, so they won't be very economical to make until your maximum health is higher. Heart crystal ore - An ore that spawns in the world. Becomes more common when further from spawn, by default. Heart crystal shards - Dropped when heart crystal ore blocks are mined. You can also configure these to drop in place of heart containers. Heart dust - Crafted from a heart container and used to make bandages and medkits. A single heart container makes 24 dust. A difficulty bar will appear on your HUD from time-to-time (there's also a keybinding to show it). This bar actually has two parts, although you can't tell in most cases. The upper part of the bar (the largest part) is the Area Difficulty at your location. You may see this portion grow when near other players on a server, or when using a distance-based mode. The lower part is your Player Difficulty. That's the difficulty your player accumulates over time, which is used to calculate Area Difficulty in most cases. where 'value' is omitted for 'get' commands. If [value] is out-of-bounds, the command will tell you. [player] fully supports target selectors like '@p' (nearest player/yourself) and '@a' (all players). get - Check the value. The [value] parameter must be left out. set - Set the value to [value]. add - Adds [value] to the current value. sub - Subtracts [value] from the current value. Same as 'add' with a negative number. FAQ, tech support, and such. A: The easiest way is to use the in-game config GUI. From the main menu, click Mods, select Scaling Health, click Config. Or if you are in a world, press Escape and click Mod Options. If you prefer to edit the file directly, it can be found at config/scalinghealth/main.cfg. If you see an asm.cfg file, you can ignore/delete it as it is no longer used. Q: How do I disable the difficulty system? A: Set "Max Value" under the "difficulty" category in the config file to 0. You won't be able to gain any difficulty, so the effects of the system are effectively disabled. Q: Is the health system compatible with other mods? A: It depends. Mods that use modifiers to change health seem to work well enough together. For player health, Tough As Nails has no issues, but Cyclic's heart containers are completely overridden by Scaling Health. For mobs, I've seen some cases where modifiers stack together in undesirable ways. Probably best to just allow one mod to tinker with health in each case. A: Let me know about it! There's a good chance I'll add it for you, if it fits with the mod. Please use the issue tracker (link at top of page), otherwise I will not do it. Q: Can I use this in a mod pack, make videos/streams with the mod installed, or share/publish config files? A: YES! And I'd love to see your work! Send links if you want, but it's not required. A: NO! Absolutely not! You can link back to here for downloads if you want to promote my work on another site, but all downloads should happen through CurseForge. Q: Can we get a port to <insert ancient Minecraft version here>? A: No. Too much work for too little reward. Is it possible to Disable The Scaling Health Thing For players only? Or to have only a maximum of 20 Hp? Yes, you can set a cap for player health. In 1.12.2, the option is "Max Health" under player/health. In 1.13.2, it's currently in the dimension config files, option name is player.health.maxHealth. Use the issue tracker next time. This is exactly why some devs disable comments entirely. Saying "it crashes" usually doesn't help. But I may know what the issue is in this case. hello! so ever since the one life 3 (or 2.0) came out, i really wanted to upgrade from the season 2 modpack to the 3rd. everything was the same as their server settings, except one detail that has annoyed me for months... the little text next to the hearts is not red... (i have really bad ocd) i have it set to psychedelic which is really cute but it's not the same :( is there a possible way you can help me set the little 2x to red or is it impossible?? Not sure how they got it solid red in the first place (assuming I'm reading that right). The normal default is GREEN_TO_RED style. I can add a solid color config to the next version. Okay, please help me with this. I am doing a One Life SMP, and I want to learn how to turn of Regeneration, because whenever I lose health, it regenerates even though Natural Regeneration is off. In the config, set "Enable Bonus Regen" to false. In reply to SilentChaos512: I turned it to false, but it still isn't working. Is the regen "vanilla-like" (rate based on food?) Scaling Health's bonus regen is fixed-rate, and the heal amount is proportional to max health. Double check the config file on the server and the game rule. Just changing the config through the config GUI or editing it locally won't update the server. Please use the issue tracker. Include a full crash report. When using the gamestage integration, does the difficulty still go up after setting it when the stage is unlocked? No, it's a complete override. Players get the highest value of all unlocked stages. Try setting "Custom Heart Rendering" (under client) to false and "Starting Health" (under player/health) to 40. I assume you want to be locked at 20 hearts, so maybe set "Max Health" to 40 as well. 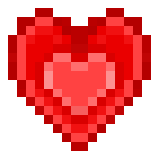 I cannot seem to find the Custom Heart Rendering I have found starting health thank you!